"Green infrastructure is a key component of healthy places"
A blog on Green Infrastructure by Ivan Clark, Scottish Natural Heritage. SFHA’s Innovation and Future Thinking Programme, supported by Wheatley Group, is bringing our members and other stakeholders together to collaboratively develop new ideas and solutions for the future. Over 60 individuals are currently working across ten projects, following three Innovation Boot Camps in August and September which generated ideas and a range of ambitious priorities. Over the next few weeks, Housing Scotland Today will feature a series of blogs by the leaders of these projects. This week’s blog is by Ivan Clark from Scottish Natural Heritage, who is leading a project on Green Infrastructure and Social Housing. Green infrastructure is a key component of healthy places. Greenspace and other green and blue features of our built environment provide opportunities for playing outdoors and for people to connect with nature and with each other. Green infrastructure can help make places distinctive, attractive and welcoming. Greenspace around buildings can be used to manage flooding, mitigate the impacts of air and noise pollution and provide opportunities to grow food. Considering green spaces as ‘green infrastructure’ in this way can help to create places that support healthy lifestyles and thriving communities. But there are still many places in Scotland, often associated with areas of disadvantage, where green infrastructure is of poor quality, or is not fulfilling its potential in terms of the number of benefits it could provide. This is why Scottish Natural Heritage is working with SFHA, Architecture & Design Scotland and the social housing sector to help deliver better green infrastructure associated with social housing. The ‘Green Infrastructure and Social Housing’ project will provide design support for social housing providers in the early stages of procurement. The aim is to produce exemplar designs for new social housing that maximizes the benefits of green infrastructure and minimizes the long term maintenance costs associated with outdoor space. 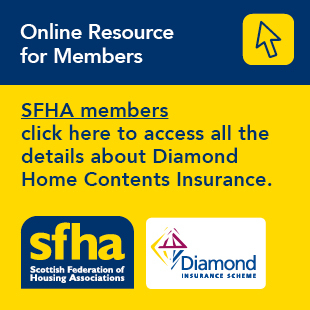 If you would like to join the Housing Innovation Community, find out more about any of our projects, or help to shape future priorities, then please get in touch at lwilson@sfha.co.uk and follow us on Twitter: #housinginnovationscotland.